The state of Georgia has more than delicious peaches. According to the Georgia Department of Natural Resources wildlife division, it is also home to four species of rabbits. These rabbits are cottontails. According to the Georgia DNR website, they rank third in small-game hunting popularity within the state. Eastern cottontails (Sylvilagus floridanus) are not only the most common rabbits in Georgia, they have one of the widest distributions worldwide. They have brown to grayish fur, large distinctive eyes and their famous white tails. They’re active year-round; like most rabbits they’re productive breeders. They have an interesting mating ritual: The male chases the female until she turns and spars at him with her front feet. They then crouch and face each other, until one jumps into the air. They repeat these actions several times before mating. When it’s breeding time for swamp rabbits (S. aquaticus), both rabbits perform a jumping sequence; then, after mating, the female begins chasing the male again. Swamp rabbits are also known as cane cutters, and they are the largest rabbit in Georgia. They average 17 inches in length and weigh up to 7 pounds. As their name indicates, they’re typically found near water or wetlands such as beaver ponds or canebrakes. Savannah panic grass is one of their preferred foods; typically they do not damage crops. Marsh rabbits (S. palustris) are Georgia’s smallest rabbits, usually weighing less than 4 pounds. They live in wetland areas and don’t have a negative impact on human agriculture. Their average life span is 4 years, but in the wild, most live less than a year due to their popularity with predators. 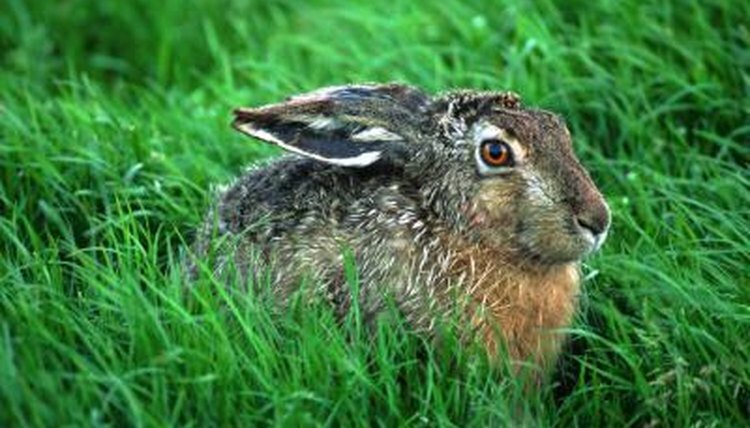 Like most rabbits, they are nocturnal; two of their main predators are great-horned owls and marsh hawks. Marsh rabbits are excellent swimmers who use water to escape. However, they are also a popular meal with water moccasins. Appalachian cottontails (S. obscurus) are the rarest rabbits in Georgia. They live in elevations of 3,000 feet or higher. Georgia is the southern end of their range, and they are a protected wildlife within the state. Since fruit is part of their diet, they’re important seed dispersers. They’re also a food source for a variety of predators. Their average life span is only one year. However, they’re prolific breeders. Females can breed immediately after giving birth. It’s unknown why they’re limited to higher elevations. They’re currently listed as near threatened on the IUCN Red List due to decreasing populations.